Adapted by Mountain Community Theater from the novel by Valentine Davies. 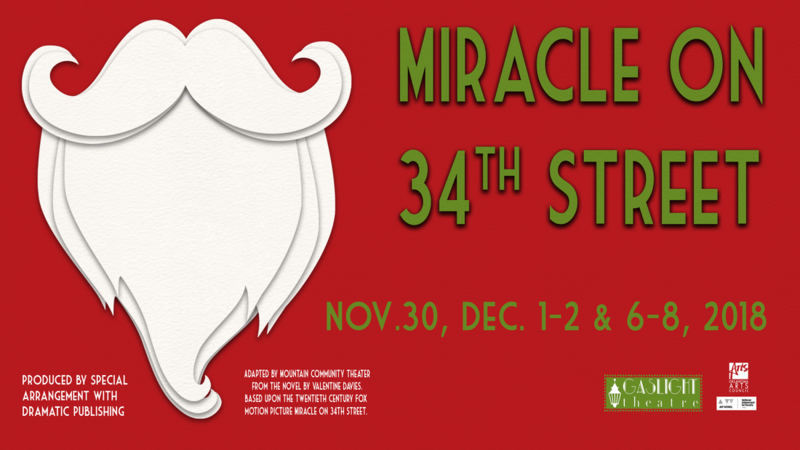 ​Based upon the Twentieth Century Fox Motion Picture Miracle on 34th Street. Produced with generous support from Enid News & Eagle and Eagle Marketing on behalf of United Way of Enid & NW Oklahoma and the Northwest Oklahoma Osteopathic Foundation. Capture the spirit of Christmas with this timeless classic! Miracle on 34th Street takes place between Thanksgiving Day and Christmas Day in New York City, and focuses on the impact of a department store Santa Claus who claims to be the real Santa. If you really believe, anything can happen. Enid News & Eagle and Eagle Marketing are sponsoring a special fundraiser performance benefitting the United Way of Enid and Northwest Oklahoma.